By now, you may have heard of Bigelow Aerospace's announcement last week laying out some details from its business plan. In this week's The Space Review, Jeff Foust transcribed many of the details of the plan, so I will not repeat them here. My first reaction was that these prices seem awfully high -- they are low only in relation to the outrageous prices for work at the International Space Station. But after thinking about the details over the last week, I have to admit that the business plan as stated is plausible for Bigelow's target markets: private business clients and sovereign clients. For private businesses, the price and execution will be the driving factors. The stated prices for some Bigelow services are high. However, it seems likely that Bigelow will aggregate lots of small pieces of business. The key will be to make it easy for each client to start very small -- well under a million dollars -- to get its feet wet. This strikes me as a very laborious and risky business for Bigelow. It will require lots of client hand-holding. This business probably will start very slowly. And even if Bigelow executes flawlessly, the attractiveness of microgravity manufacturing and research is unknown. For sovereign clients (countries), the PR value and politics will be the driving factor. It seems that the demand at these prices will be inelastic -- e.g., a country would be no more or less willing to buy a month of hang time if the price is $15 million per month versus $5 million per month, since neither value will break the budget. The pool of potential sovereign clients seems healthy -- 50 or 60 countries that may be interested and capable of maintaining an affordable space program. 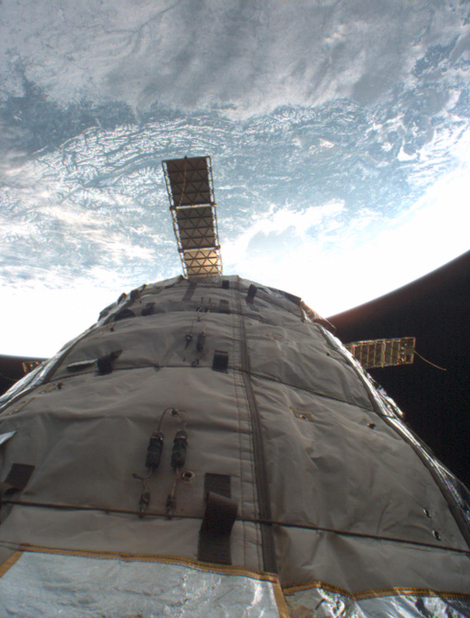 The market is proven, with South Korea's recent purchase of a flight to ISS aboard the Soyuz and associated services. Bigelow may see some of its business driven by rivalries between countries. For instance, Taiwan may gain a PR benefit by maintaining a space program in the face of Chinese space expansion. Likewise, Pakistan, impoverished as it is, might see a need to keep up with the Indian space program. The transportation piece of the business plan confuses me a little. I understand the necessity of diversity in the pool of potential launch vehicles and agree that sacrificing low costs for diversity might make sense. However, Bigelow takes away much of that diversity by stating that it doesn't want to do a splash landing. Unfortunately, the vehicle that may drive down Bigelow's operating costs the most -- the Falcon 9 with Dragon capsule -- splash lands. Is a splash landing really that dramatic? Were the Apollo capsule landings too exciting? Overall, I'm intrigued by Bigelow's plan. It isn't obviously ridiculous, and Bigelow has several years to adjust the plan as the company learns more. The transportation picture is a little murky, and I will be interested in knowing more about Bigelow's plans in that regard. While surfing Bigelow Aerospace's web site today to put together an article, I noticed that the company has expanded the positions for which it is hiring, to include astronauts. It is not often that you see a job posting for experienced astronauts! Given the limited opportunities for flight in the NASA astronaut corps, I can imagine that Bigelow will have its fill poaching from NASA. 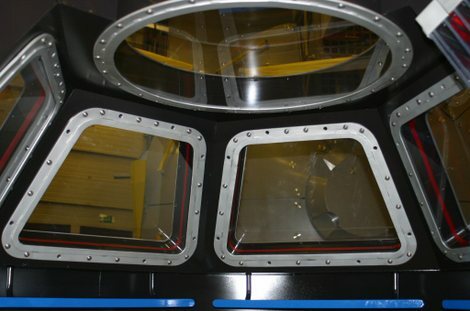 By now, several articles have been written about SpaceX and RocketPlane-Kistler winning space station resupply/recrewing demonstration contracts from NASA. Clark Lindsey has a nice rundown, so I will not cover the basic news here. First off, congratulations are due to SpaceX and RPK. The prospect of cash now for development ($278 million for SpaceX and $207 million for RPK) and a further 6 flights per annum for resupply/recrewing of the International Space Station must be very attractive to each company. After all, 6 flights per annum is over 10% of the global space launch market. However, I hope that especially SpaceX's larger goals don't become caught in a bad business relationship with NASA. First and foremost, NASA is a political animal that is funded by annual appropriations by congressmen from states and districts that will benefit from the federal contracts. Secondarily, NASA has a manned space flight mission that burnishes the prestige of the United States and its allies. Well down on the list of priorities is expanding our scientific knowledge and technological know-how. Hardly on the list of priorities at all is price-effectivene contracting, and as such, any relationship with NASA will tend not to cultivate it. Any program that promises to decrease the price of these federal contracts seems likely to suffer from lack of political support. 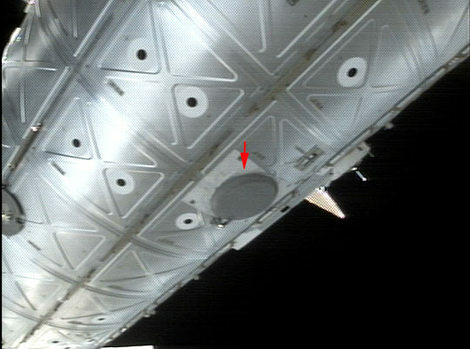 In order to win the contract, RPK banked on this trait of NASA, and acted in a manner well suited to an old-line NASA contractor. It spread the subcontracts among a number of companies with facilities in politically well connected states and congressional districts. It partnered with Orbital Sciences and Lockheed-Martin, the old guard of the aerospace business with absolutely no interest in price-effectiveness. I understand this cynical approach, especially since much of the management of RPK are retirees from Lockheed-Martin. I'm somewhat heartened by the fact that SpaceX didn't take this approach, and won 3/5ths of the money in the program anyway. RPK can take care of the political cover for the program while the real action is concerning whether or not SpaceX can deliver. After all, Michael Griffin, NASA Administrator, was the lead on Elon Musk's feasibility study for the Falcon. We can surmise where Griffin's bet is placed. At the end of the day, at a minimum, it seems prudent for SpaceX to plan for NASA being a poor customer and leaving SpaceX in the lurch. Congress may kill this program at any time, so SpaceX should treat each check from NASA as if it's the last. 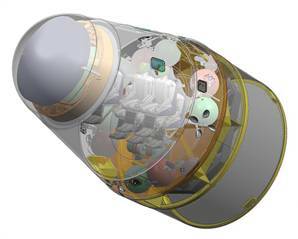 On Friday, Bigelow Aerospace published an intriguing half-announcement. 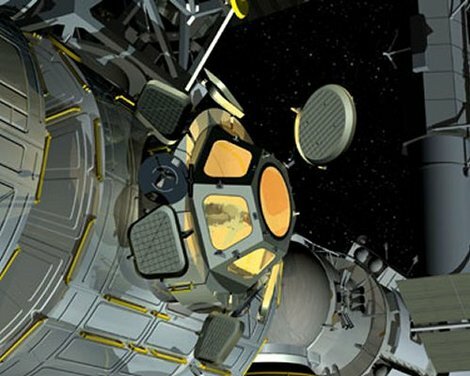 The post hints at an ambitious time-frame for space station module development. What's the impetus behind this announcement? My speculation is that Bigelow signed a substantial customer for its modules. 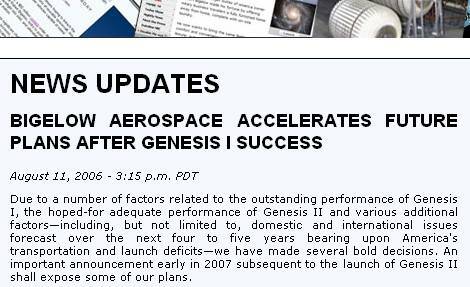 The announcement includes a paragraph that states that Bigelow is cutting its "Fly Your Own Stuff" program short -- the program will begin and end with Genesis II in early 2007. The program was an experiment meant to open up an additional revenue stream for Bigelow, so apparently the need for that sort of revenue stream is no longer considered a priority. But who would be a substantial customer for Bigelow? I don't imagine Bigelow predominately to be a U.S. government contractor -- or at least predominately a NASA contractor -- so it seems likely that an unannounced entity of some size made an order. The reference in the announcement to the U.S. launch deficit could be due to a quantity order of SpaceX Falcon 9 flights at a suitable price. 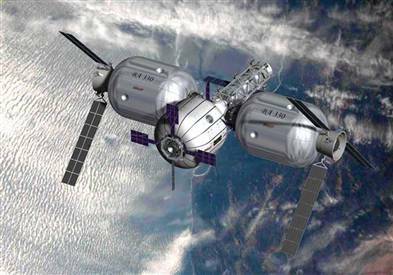 SpaceX has been moving up its plans for manned spaceflight to enable it to deliver on a possible NASA space station resupply contract due 2010. It seems odd that Bigelow would place an order only months after SpaceX's failure on the Falcon 1 maiden flight. Perhaps Bigelow saw that Elon Musk had the fortitude to work through SpaceX's problems. Overall, this announcement points to some fun possibilities. 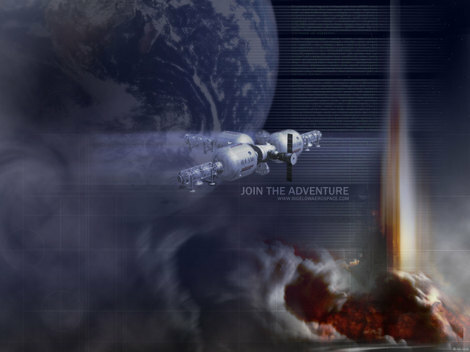 In the March, 2005 edition of Popular Science, accompanying Michael Belfiore's nice article about Bigelow Aerospace, is Mondolithic Studios' fascinating visualization of CSS Skywalker, an hypothetical Bigelow Aerospace space station. It seems like a good time to reference it, now that Bigelow has flying hardware. This looks to me like a 10 Nautilus station plus an observatory module or control center module of some sort. The station consists of probably around 4,000 cubic meters of usable volume total. This strikes me as an enormous volume -- about 20 times the volume of my small studio apartment. There are no rotating modules, which I think you would like in a station of this size. Gravity is important for going to the bathroom and for taking a shower, if for nothing else. I don't know if you would get seasick by moving into and out of gravity often, however. 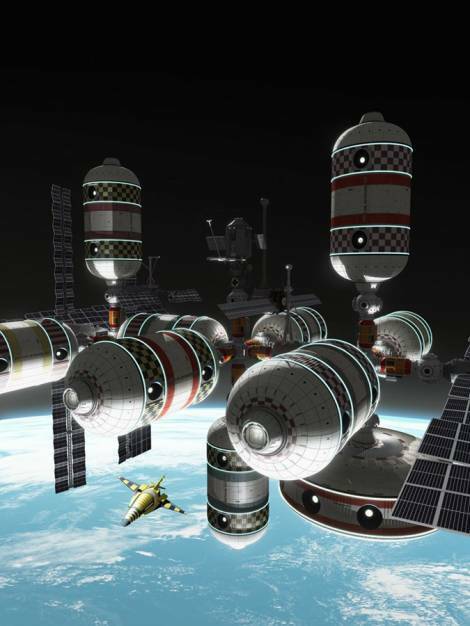 Maybe the whole station would need to rotate, except a module or two to provide the weightless experience. Update: Chris Wren at Mondolithic Studios was kind enough to write to explain some aspects of the station. [W]e went with the idea that one or more of the habitat modules would have a small certrifugal exercise wheel inside, like a hamster wheel. No one is really sure how to supply water/air/power to a fully rotating module just yet, so we figured we would leave it out... One other option would be to arrange the modules in a vast ring, and spin the ring, a la 2001: A Space Odyssey. Here's a post of mine regarding the 2001 station. Bigelow Aerospace has designed a cool Google Maps "mash-up" that tracks in real-time the Genesis I module as it orbits Earth. Here's the module directly above mission control in Las Vegas. 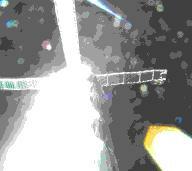 The underlying data is provided by the Northern American Aerospace Defense Command (NORAD). 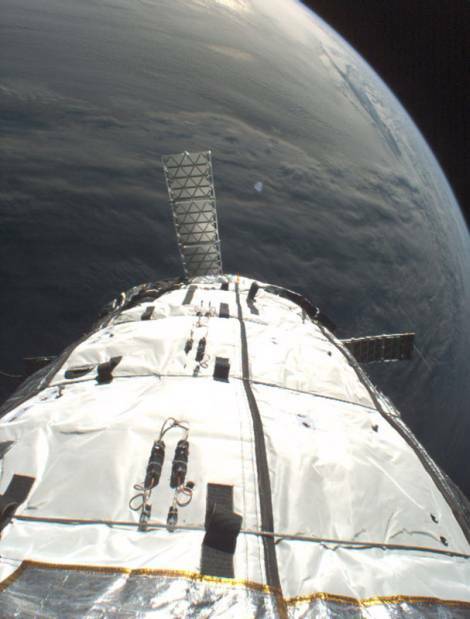 Since the module's path isn't often over a location at which Bigelow has a high-speed data antenna, I wonder whether the company eventually will create an omnipresent satellite communications system like NASA's Tracking and Data Relay Satellite (TDRS) system. In any event, kudos to Bigelow for releasing such neat tools and information so quickly after launch of its web site. This is a big change in user-friendliness from the web site of only a couple of months ago.